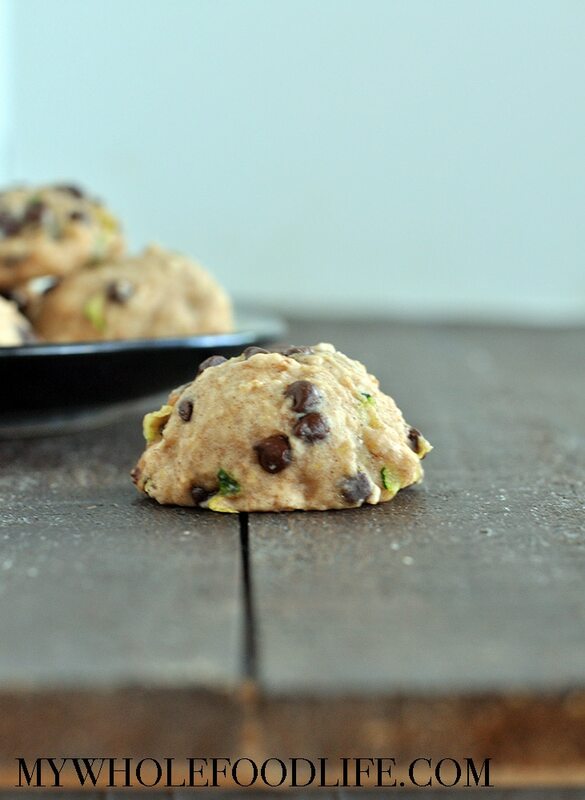 Zucchini Chocolate Chip Cookies. My 4 1/2 year old is pretty picky when it comes to cooked veggies. She loves raw veggies, but I am always looking for more ways to sneak cooked veggies in. That is where these zucchini chocolate chip cookies come in. She loved these zucchini cookies so much. She had no idea there was a hidden serving of veggies inside. In fact, she kept trying to sneak more off the baking rack while they were cooling. If you like this recipe, you may also like my chocolate zucchini muffins and my zucchini chips. 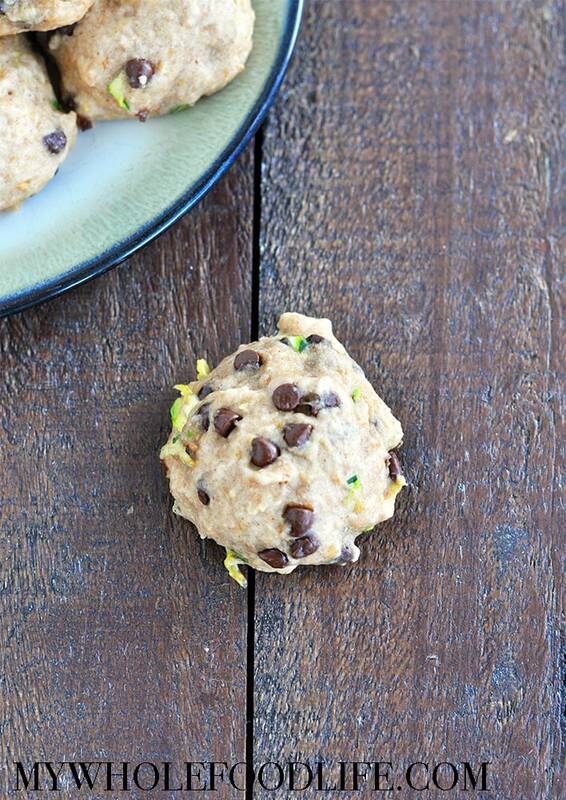 A yummy cookie with a hidden serving of veggies! In a food processor, puree the zucchini. Transfer to a bowl and let it sit a few minutes. You will start to see it release some water. Dump out any excess water you see. Use a towel to press out a little bit more of the liquid. Once you are done, transfer it to a bowl with the rest of the wet ingredients. Drop cookies on a lined baking sheet and cook for about 10-12 minutes. Store these cookies in an airtight container in the fridge. They should last 2 weeks in the fridge. You can also freeze them for longer storage. Enjoy! The green wouldn't bother me at all (I love zucchini) but my daughters and my hubby are squeamish about certain things so I made these and to disguise the slight green bits (I didn't want to peel the zucchini because of the extra fiber/vitamins in the peel plus it was homegrown organic so I knew there were no chemicals involved) I just added in about 1/4 cup unsweetened cocoa powder. Made them chocolate chocolate chip cookies, disguised the green, added a bit more iron and fiber with the cocoa and they were incredible! Oh yay! Glad you liked them! These were a big hit with my family! Thanks for the awesome recipe. You're welcome! Glad you liked them Kim! Hello. Can I substitute 2 c. of white whole wheat flour for 2 c. of gluten free flour? Thank you! I think you could, but it may be more dense in texture. My 8 year old made these with me tonight, and I am pleased with how they turned out. Not a bad use of zucchini. :) I would like to try adding cocoa powder as someone else suggested; I think the extra boost of chocolate flavor would be good too. So glad you liked them Jennifer! Do you need the maple syrup? Just trying to make these a smidge healthier. 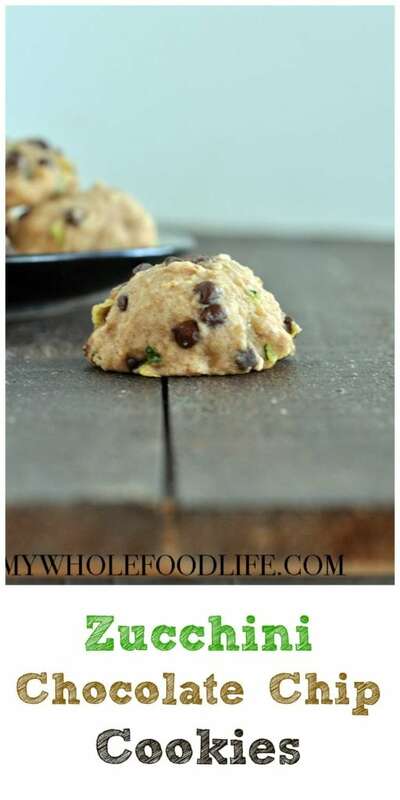 I am making your nutri grain bars right now and getting ready for these cookies!! Yum!! A wuick question about the zucchini though... Do you steam the zucchini before pureeing? Yay!! No. I didn't steam it at all. Just shredded. If your zucchini is large, you may want to squeeze it to remove excess moisture though. This recipes sounds amazing!! Is there a non-grain flout that will work? Sweet potato or squash? Thank you for all the amazing recipes! Thank you! Almond flour might work if you add another egg. That could work, but I think it'd definitely need to be cooked longer. Maybe 20 minutes?